Salman Khan‘s Bigg Boss is one of the most popular reality shows in India. The show is not only entertaining, but controversial too. Bigg Boss 11 kicked off recently and we have to say that this has been one of the most controversial starts to any season. Not only did we see fights, but a contestant (Priyank Sharma) was ousted because he slapped and pushed a fellow contestant (Akash Dadlani). But that’s not it! Zubair Khan, who reportedly has links to Dawood Ibrahim’s family, was also very abusive towards the housemates and he even threatened them several times with dire consequences. This did not go down well with host Salman and he let his frustration be seen. He not only slammed Zubair during the show, but also gave him a warning. However, even before getting a chance to improve, Zubair was eliminated from the show last night. Before he left, he created a ruckus by eating all his medicines. The team rushed him to the doctor and while we hear he was fine, looks like he wasn’t happy with his ouster from the show. In fact, he has gone on to file a written complaint against the show as well as actor for threatening him. But wait, there’s more! 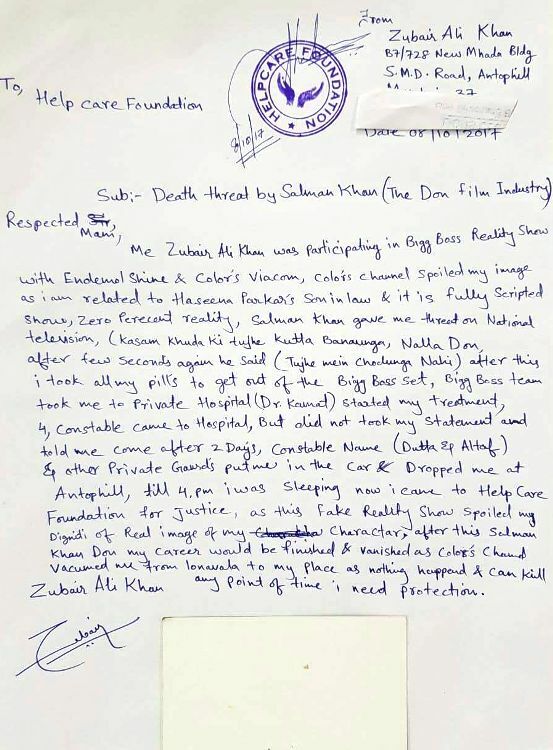 In his written complaint, Zubair has even made a shocking confession that Bigg Boss 11 is scripted. Don’t believe us? Well check out his written complaint to a NGO after the police apparently refused to file an FIR. He made a few other revelations in the complaint note like how Salman and Colors threatened him and how the police refused to file an FIR. However, after the NGO issued a letter to the police to hear Zubair’s case and file an FIR, the ex contestant will travel back to Lonavala and finally lodge a case. We wonder what does Salman have to say about this?